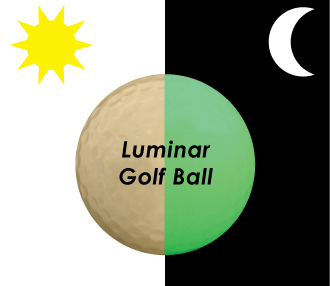 Luminar or Luminescent golf ball is full function tournament requirements golf ball. Two-piece construction high C.O.R. polymer core with soft Surlyn cover. No any mechanical or electronic parts that reduce golf ball performance inside the ball. After absorbing the natural light or charge with ultraviolet light (Blacklight). The ball will glow for about 5-10 minutes. At that moment, the ball is excellently to be seen and will be seen for another 3-4 hours while slowly glomming down if not recharged. - Night Driving Range that need to control lighting. - Putt putt or mini golf.